Shapeshifter Xander will remain stuck in oblivion between good and evil until he is marked-either with the sphere that will identify him as a servant of the underworld or with the water mark, working for the keepers of humans, vampires, and warlocks. One decision will mark him and his twin sister Mira equally. She is in love with a man bearing the water mark and wants Xander to follow the path of the good. But Xander loves a black witch, a minion of the underworld. All he has to do to join her forever is kill. After all, there's something good about being bad. Mira and Xander are shape-shifting twins whose destiny has yet to be shown to them. They must decide if the will follow the way of the good guys or the evil demons and warlocks. Mira longs to join the good, while Xander longs to be bad....both for the sake of love. But their destiny is tied together, and they must chose together. Which fate will they decide? A nice and fun, quick read. 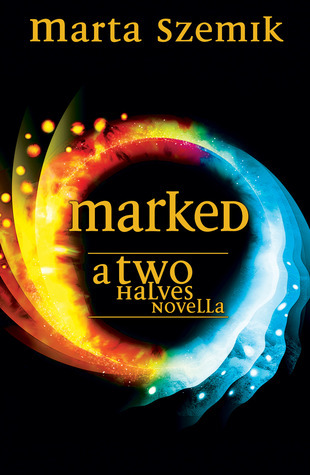 Marked introduces us to the twins, Mira and Xander, who play a large role in the novel, Two Halves (review up in a couple days). It sets the world and the rules in a fun and exciting way. That sounds really interesting. Thanks for the review.